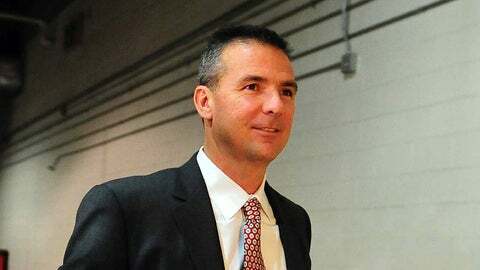 Indianapolis, IN, USA; Ohio State Buckeyes head coach Urban Meyer arrives at the stadium prior to the 2013 Big 10 Championship game against the Michigan State Spartans at Lucas Oil Stadium. Raekwon McMillan pleased Ohio State head coach Urban Meyer and fans of the Buckeyes Monday when he verbally committed to OSU during a press conference at his high school in Georgia. A four-star linebacker from Hinesville Liberty County, McMillan chose Ohio State over offers from Alabama and Clemson among others. McMillan figures to find an inviting depth chart when he arrives in Columbus next year, particularly if All-Big Ten linebacker Ryan Shazier chooses to skip his senior season and enter the 2014 NFL draft. Veterans Joshua Perry and Curtis Grant are scheduled to return next season, but both had ups and downs as first-year starters on a defense that was a liability as the Buckeyes fell short of their goals of winning the Big Ten and playing for the national championship. Experience behind them is very limited. McMillan said early playing time is important to him but cited his relationship with the coaching staff as a larger factor in his final decision. “There was just something special about Ohio State University,” McMillan said in a press conference televised by NBC Sports Network. He cited conversations with coaches including Meyer, defensive coordinator/linebackers coach Luke Fickell and defensive line coach Mike Vrabel — who were part of a group that made an in-home visit with McMillan last night — for reason to feel comfortable with heading far away from home for school. McMillan’s commitment gives Ohio State 18 verbals for the 2014 class. He is the fourth linebacker joining a trio of four-star prospects from Ohio – Dante Booker of Akron St. Vincent-St. Mary, Kyle Berger of Cleveland St. Ignatius and Sam Hubbard of Cincinnati Moeller. Berger missed most of the season with a torn ACL while Booker and Hubbard each led their teams to state championships. Booker was named Ohio’s Mr. Football for his standout play with the Fighting Irish and was recently profiled by our Zac Jackson. McMillan is the 12th out-of-state commitment for Ohio State this year. He is the third highly regarded prospect from the state of Georgia to commit to Ohio State since Meyer was hired in last 2011, joining five-star safety Vonn Bell of Rossville Ridgeland and four-star linebacker Trey Johnson of Central Gwinnett. Both were members of the 2013 class and contributed on special teams this past season.